There are three main types of termites that attack structures and residencies in southern California. These would be Subterranean, Dampwood and Drywood Termites. Unfortunately, if you own a property around here, then you probably already know this and the costs that they can incur. The best defense against all types of termites is being proactive. This means doing everything that you can to keep them away, inspecting the property continuously and treating any problems as necessary. For the last two options, it is normally better if you let a certified licensed professional (like us) take care of them, this way you will get guaranteed results. But before it gets to that point, there are many different things that you can do to keep them away from your property which will be low cost as well. Wood debris that it’s close to your home or in your crawl space can attract, and give a starting point for nesting to termites. Regularly, do a visual inspection around the structure looking for cellulose debris like mulch, tree stumps or cuttings, and leftover wood. Clean it up and dispose of it properly. This will lessen the probabilities of termites lingering around your home, and then swarming and infecting it. The primary job of termites is to decompose dead wood. Which is why unfortunately they attack wood structures and firewood. Without knowing it, you could be bringing them into your home. Make sure that it is properly stored so that you can avoid any problems. Keep it stored on the exterior of your property, as far away as possible from any wood structures. Make sure to cover it though and keep it raised from the ground, that way it will be ready for use when you need it. One of the main reasons that cause pest related problems is moisture. This creates a more ideal environment for termites, fungi, and other pests. Perform regular inspections around your property and crawl spaces to avoid any excessive moisture conditions. This can come possibly in a plumbing or roof leak, which has a straightforward solution, which is repairing it with a company like The Roof Clinic that you can find online. Another important thing to consider is that all water that could come due to a storm or other conditions is diverted away from the structure. This can be done by installing gutters and pointing them away from it. Maybe installing longer downspouts to assure that water will not get stuck close to your foundation. One of the first entry points for termites is exterior wood. This is because it is normally due to the reason that it is exposed and easier to access. By sealing any cracks, and keeping the wood painted you will be creating a protection layer against termites, moisture and other pests. If at any point however you notice any infestations, give us or your licensed inspector a call to resolve the situation before it becomes a problem. When wood is in direct contact with the soil in the ground, it opens a new freeway for termites, especially subterranean termites to your structure. Avoid this by raising any exposed wood and siding. Sometimes it’s as easy as trimming the wood, but some other options are adding raised brackets, or a concrete base to set a better foundation. If wood to earth contact is not avoidable, try using pressured treated wood instead. This can be found readily available at any lumber store like Home Depot, Lowe’s or Dixieline. This is a basic approach that you can take to keep termites and other bugs out of your property and harder to reach places. The most common areas for installation and air vents, and exhaust pipes. These areas normally create openings to attics, crawl spaces and wall voids. The more protected that your property is the better chances that you have of keeping termites and wood destroying organisms away from it. Cardboard boxes, books and paper are all cellulose material, which is a food source for termites and other pests. Be sure that when storing any of these items in the interior of your home, it’s attic or crawl spaces that you do so by placing them first into plastic containers. This will not only better protect your items, but it will do so with an extra layer that is very hard, if not impossible for pests to penetrate. One common area of infestation in residences is furniture. Many times, as we are close to the border, this one is brought untreated from Mexico. Be sure that when buying or taking any new piece of wood furniture into your home to inspected and treat it as necessary. Another recommendation is to keep it away from the walls, this will felicitate inspection and create a padding layer between any infestation that might occur and your residence. In southern California, it is very common to have wood fencing made from cedar or Douglas fir pieces. This wood member, although they have a natural protection layer against wood destroying pest like termites, are unfortunately one of the first ones to get infested. This is because it is normally neglected, not properly sealed nor painted. Which in turn, facilitates termites to create a nesting spot and when nesting / swarming season comes around they look at your structure as a good place to settle down. Avoid this from happening by properly maintaining your wood fence. Seal and paint its wood member every 1-3 years, as well as replace any damaged or infected ones. If the problem is more severe, give us a call so that we can control it before it gets out of hand. Regular termite and wood destroying organism’s inspections can save you a lot of headaches and money in the long run. Termites create an estimated 6.5 billion dollars in damage each year, don’t be part of that statistic. A licensed and trained termite inspector will find harder to see areas, as well as finding hidden damage by probing exposed wood members. Once the inspection is completed, he will come up with a cost-effective solution that will guarantee the extermination and eradication of the infestation(s). 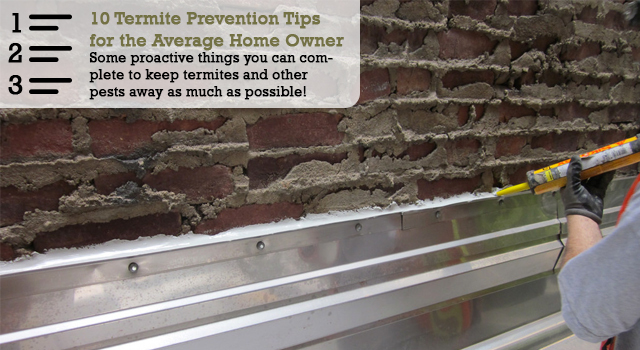 If you follow these termite prevention tips and recommendations your property will be better protected from them. Remember that there is no way of making your home or structure termite proof, but by being proactive you will save a lot of headaches and money in the long run. If you run into any problems or need assistance identifying or controlling termites, wood destroying organisms or other pests, please give us a call at (619) 421 – 2101 and we will be more than happy to help you. Please leave any comments or questions in the section below. And if you have any other ideas please share them as well.